I. Ce-Celia Goodshapes is a very unique mare. 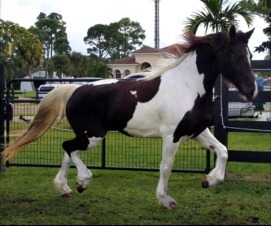 The first thing we noticed about her is that she has a detailed dark pattern in her tobiano coat color that looks exactly like a Friesian head with a mouth, ears and a flowing mane. Viewed from the back, her left side is white and her right side is black. 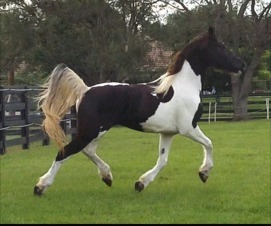 Her pinto pattern is truly spectacular and flashy. Ce-Celia moves as if she’s floating on air. She has excellent confirmation, a forward walk and great hind action where she steps well under her body and pushes from the rear. It’s no wonder that she was awarded 1st Premie and Champion of the entire BPS keuring in the Czech Republic as well as Champion of the foals. Ce-Celia has had one foal and is an excellent mother. She is being prepped to be backed but is not under saddle at this time. Her sale price reflects that she's not under saddle yet (through no fault of her own, we've just been to busy to get her trained yet). Once trained, Ce-Ce would excel in any discipline. She would be a fantastic jumper, eventing, or dressage horse. 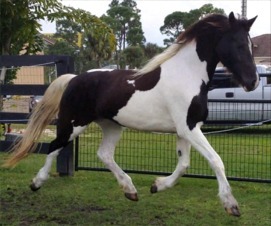 She has the sport ability of the Warmblood just like her sire, Ceasar Ter Linden. 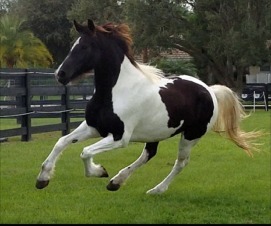 Ceasar’s sire is King, a black and white KWPN driving stallion, who drives alongside mares. In 2006 King was seen around the world when he helped lead over 100 horses stranded by flood waters in Holland. This bravery showed proof of his level headed temperament. King is out of the KWPN Keur, Preferent, Prestatie Dutch Warmblood Wanda whose sire is the legendary Pericles. Wanda is also a full sister to Samber. King’s sire is Purioso. He was very successful at his stallion testing and scored an 8 for free jumping and 9 for jumping under saddle. Purioso has five KWPN approved sons. His offspring are well known for their jumping ability and fantastic gaits. He is one of the founding horses for specialized show jumping and dressage pedigree lines. 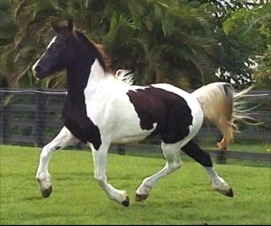 Purioso produced three Olympic horses, Olympic Wendela, Olympic Cocktail and Olympic Ambush. Wendela and Cocktail are two very different horses in different disciplines, one at the highest level of Jumping and the other in Dressage. Purioso’s sire is Furioso II, one of the founders of the modern European sport horse breeding. Even today he is still influencing many studbooks in Europe with his sons, grandsons and great-grandsons. Some of his prodigy include Voltaire and Concorde in Holland and Fidelio and Florestan 1 in Germany. 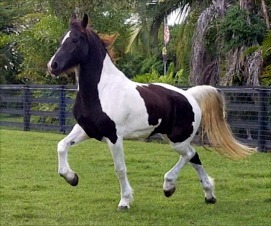 Furioso II became the symbol of the modern Oldenburg sport horse breeding. Furioso II produced 200 state premium mares and no less than 68 approved sons. Furioso II influenced breeding worldwide. His full brother is the French stallion Mexico, who’s son Le Mexico became famous in Holland as a producer of jumping horses. Ringo’s dam is Lianne, who was sired by Olympic Ferro and whose dam was Cindy, another Samber daughter, so Lianne’s damsire is Samber. Olympic Ferro was a Dutch sensation at Aachen and one of the most famous dressage stallions of modern times. Samber is one of the greatest and most far reaching and influential of all Pinto Warmblood sires. In the history of the KWPN, Samber was the only pinto stallion to complete the 100 day performance test and gain approval in the KWPN studbook. He passed the performance test in 1979. His temperament scored him the maximum of 10. He was a very talented jumper, eventing, and dressage horse. He jumped at Z level with a 15 year old rider and when he returned to dressage he competed at Grand Prix. Olympic Ferro stood 16.3 hands and was one of the KWPN’s foundation stallions and a successful breeding stallion who sired eleven KWPN approved sons. He was also an approved stallion at the Hanoverian Verband, Danish Warmblood Society, the French and Oldenburg Verband and sired many approved stallions outside of the Netherlands. Ferro’s offspring are beautiful, with elegance, presence and talent for sport. They tend to have excellent toplines, a lot of room in the trot, excellent use of the hind legs, fine elevation, and excellent overall confirmation suitable for the upper levels of dressage. When a Dutch horse competes in the Olympics, they are given the title Olympic, which goes in front of their names. Ferro received his title upon competing in the 2000 Olympics that were held in Sydney. He was ridden by Coby van Baalen for the Dutch team and won team silver medals, finished fifth individually and fourth in freestyle and he had an individual score of 74.92%. As a three-year-old he was champion of his performance test at Ermelo, where he achieved the outstanding results of 6.5--step, 8.5--trot and 8.5--gallop. During his career Olympic Ferro won many Grand Prix and Grand Prix Specials. He is renowned for consistently achieving high scores for piaffe and passage. The KWPN awarded Olympic Ferro the "Keur" predicate in 2000 and the “Preferent” predicate in 2004. Olympic Ferro held the #1 position of the BN World Stallion Rankings late into his career and maintained an outstanding dressage index of 153 with the KWPN, boasting an impressive 87% reliability index. Olympic Ferro was also valued for his jumping influence with over 111 points in the KWPN's jumping index and an 80% reliability factor. On the 2009 WBFSH dressage stallion standings, Olympic Ferro is in 8th place. On Ce-Celia's Friesian side of her pedigree, her dam is Fea Fan Murer, a Ster Mare. Fea’s sire is Jesse 435 Sport and dam sire is Tsjibbe 388. Ce-Celia's pedigree also includes Friesian stallions such as Leffert 306, Tamme 276, and Bearend 347, Doeke 287 and Ulke 338 as well as many Ster, Model, and Preferent mares.